Qt Quick Controls 2 consist of a hierarchy (tree) of items. In order to provide a custom look and feel, the default QML implementation of each item can be replaced with a custom one. Sometimes you'll want to create a "one-off" look for a specific part of your UI, and use a complete style everywhere else. Perhaps you're happy with the style you're using, but there's a certain button that has some special significance. color: button.down ? "#d6d6d6" : "#f6f6f6"
The second way to create the button is good if you plan to use your rounded button in several places. It involves moving the code into its own QML file within your project. As you now have the MyControls namespace, you can name the controls after their actual counterparts in the Qt Quick Controls 2 module. You can repeat this process for any control that you wish to add. An added benefit of these three methods is that it's not necessary to implement the template from scratch. There are several ways to go about creating your own styles. Below, we'll explain the various approaches. At least one QML file whose name matches a control (for example, Button.qml) must exist. Each QML file must contain the relevant type from the QtQuick.Templates import as the root item. For example, Button.qml must contain a Button template as its root item. If we instead used the corresponding type from the QtQuick.Controls import as we did in the previous section, it would not work: the control we were defining would try to derive from itself. The files must be in a directory in the filesystem or in the resource system. The third and fourth paths will be looked up within the QML engine's import path list. This is the same as what happens when you pass Material as the style, for example. By default, the styling system uses the Default style as a fallback for controls that aren't implemented. To customize or extend any other built-in style, it is possible to specify a different fallback style using QQuickStyle. What this means is that you can implement as many controls as you like for your custom style, and place them almost anywhere. It also allows users to create their own styles for your application. For more information, take a look at the Flat Style example. See Using C++ Data From QML for more information about this. If the style that uses the type is one of many styles used by an application, it may be better to only register it when necessary. This is the point at which it would make sense to implement your own QML plugin. Using a plugin as part of your style is not that much different from using a set of QML files. The only difference is that the plugin and its qmldir file must be present in the same directory as the QML files. It is common for a style to have certain properties or attributes that apply to all controls. Attached properties are a great way of extending an item in QML without having to modify any existing C++ belonging to that item. For example, both the Material and Universal styles have an attached theme property that controls whether an item and its children will be rendered in a light or dark theme. As an example, let's add an attached property that controls elevation. Our style will illustrate the elevation with a drop shadow; the higher the elevation, the larger the shadow. We then copy Button.qml from the Default style in $QTDIR/qml/QtQuick/Controls.2/ into a new myproject folder in our project directory. Add the newly copied Button.qml to qml.qrc, which is the resource file that contains our QML files. color: control.visualFocus ? "#330066ff" : "#aaaaaa"
One button has no elevation, and the other has an elevation of 10. With that in place, we can run our example. To tell the application to use our new style, we pass -style :/mystyle as an application argument, but there are many ways to specify the style to use. Note that the import MyStyle 1.0 statement is only necessary because we are using the attached property belonging to MyStyle. Both buttons will use our custom style, even if we were to remove the import. The following snippets present examples where the default style's controls have been customized using the same approach as the Customizing a Control section. The code can be used as a starting point to implement a custom look and feel. ApplicationWindow consists of one visual item: background. It is also possible to customize the modal and modeless items. BusyIndicator consists of two visual items: background and contentItem. Button consists of two visual items: background and content item. color: control.down ? "#17a81a" : "#21be2b"
border.color: control.down ? "#17a81a" : "#21be2b"
CheckBox consists of three visual items: background, contentItem and indicator. CheckDelegate consists of three visual items: background, contentItem and indicator. color: control.down ? "#bdbebf" : "#eeeeee"
ComboBox consists of background, content item, popup, indicator, and delegate. color: control.pressed ? "#17a81a" : "#21be2b"
border.color: control.pressed ? "#17a81a" : "#21be2b"
DelayButton consists of two visual items: background and content item. 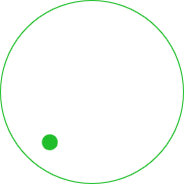 Dial consists of two visual items: background and handle. Drawer can have a visual background item. Frame consists of one visual item: background. GroupBox consists of two visual items: background and label. ItemDelegate consists of two visual items: background and content item. color: control.enabled ? (control.down ? "#17a81a" : "#21be2b") : "#bdbebf"
color: control.down ? "#dddedf" : "#eeeeee"
Label can have a visual background item. Menu consists of a visual background item. MenuItem consists of four visual items: background, content item, indicator, and arrow. MenuSeparator consists of a visual background and content item. ctx.fillStyle = menuItem.highlighted ? "#ffffff" : "#21be2b"
color: menuItem.highlighted ? "#ffffff" : "#21be2b"
color: menuItem.highlighted ? 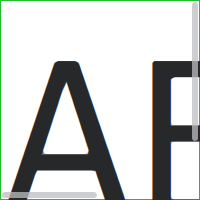 "#21be2b" : "transparent"
MenuBar can have a visual background item, and MenuBarItem consists of two visual items: background and content item. color: menuBarItem.highlighted ? "#ffffff" : "#21be2b"
color: menuBarItem.highlighted ? "#21be2b" : "transparent"
PageIndicator consists of a background, content item, and delegate. Pane consists of a background. Popup consists of a background and content item. ProgressBar consists of two visual items: background and content item. RadioButton consists of three visual items: background, content item and indicator. RadioDelegate consists of three visual items: background, contentItem and indicator. RangeSlider consists of three visual items: background, first.handle and second.handle. color: first.pressed ? 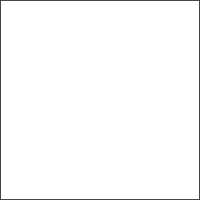 "#f0f0f0" : "#f6f6f6"
color: second.pressed ? "#f0f0f0" : "#f6f6f6"
RoundButton can be customized in the same manner as Button. ScrollBar consists of two visual items: background and content item. color: control.pressed ? "#81e889" : "#c2f4c6"
ScrollIndicator consists of two visual items: background and content item. ScrollView consists of a background item, and horizontal and vertical scroll bars. border.color: control.activeFocus ? 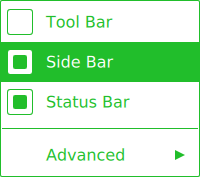 "#21be2b" : "#bdbebf"
Slider consists of two visual items: background, and handle. color: control.pressed ? "#f0f0f0" : "#f6f6f6"
SpinBox consists of four visual items: background, contentItem, up indicator, and down indicator. color: control.up.pressed ? "#e4e4e4" : "#f6f6f6"
border.color: enabled ? "#21be2b" : "#bdbebf"
color: control.down.pressed ? "#e4e4e4" : "#f6f6f6"
StackView can have a visual background item, and it allows customizing the transitions that are used for push, pop, and replace operations. SwipeDelegate consists of six visual items: background, content item, indicator, swipe.left, swipe.right, and swipe.behind. color: SwipeDelegate.pressed ? "#333" : "#444"
SwipeView can have a visual background item. The navigation is implemented by the content item. Switch consists of three visual items: background, content item and indicator. color: control.checked ? "#17a81a" : "#ffffff"
border.color: control.checked ? "#17a81a" : "#cccccc"
color: control.down ? "#cccccc" : "#ffffff"
border.color: control.checked ? (control.down ? "#17a81a" : "#21be2b") : "#999999"
SwitchDelegate consists of three visual items: background, contentItem and indicator. color: control.checked ? "#17a81a" : "transparent"
TabBar consists of two visual items: background, and contentItem. TabButton can be customized in the same manner as Button. TextArea consists of a background item. border.color: control.enabled ? "#21be2b" : "transparent"
TextField consists of a background item. color: control.enabled ? "transparent" : "#353637"
ToolBar consists of one visual item: background. ToolButton consists of two visual items: background and content item. ToolSeparator consists of two visual items: background and content item. ToolTip consists of two visual items: background and content item. Tumbler consists of three visual items: background, contentItem, and delegate.